Luckily, our dog beach is open year round in Chicago, but more pooches feel inclined to visit when the weather gets warmer. Want to take your pup to the beach? Here’s what to know before you go. Below are the official rules from the Mondog Montrose Beach. Click on the links for more information. And of course, don’t forget to brush up on your Dog Park Etiquette with our post from last week. These rules are worth a read for any pre-beach trip. As the Mondog website points out, “what is considered acceptable behavior at home, is not necessarily at the Dog Beach. 1.No food on the Dog Beach. “WATER POOPING”, as it is strictly forbidden. 4. Dogs should play with dogs of appropriate size and energy level. 6. Respect other dog owners requests to separate your dogs! 7. Close the gate behind you! 8. No unaccompanied dogs and no more than 3 dogs per adult. 10. Dogs only on the beach…no other pets allowed. 11. Dog Toys are shared, whether you like it or not. 12. Toys left on beach are garbage. 13. If it’s unattended on the ground, it’s fair game. 14. ON or OFF LEASH? 16. No Kites within the Dog Beach. Another thing to consider? Make sure your dog has a good recall. The park is fenced in, but some users have claimed their dogs can get out where the fence meets the water. Be on the safe side and practice coming when called with your pup on a regular basis. Have anything to add? Please leave a comment! 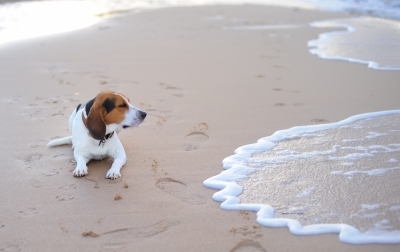 Has your pooch been to the beach? What did you both think?